In North America, the Western diet mainly constitutes a high fat, sugar and salt intake; in many cases, these elements can lead to obesity, cardiovascular disease and diabetes. Importantly, mitochondria play a critical homeostatic role in physiology by regulating various glycolytic compounds including fatty acids and pyruvate for subsequent ATP production; it must be noted that dysregulation of these essential metabolic processes can result in the aforementioned diseases. Remodeling of mitochondria-associated phospholipid acyl chains, namely remodeling of cardiolipin (CL) acyl chains, can confer functional deterioration of basic, cardiac metabolic processes but the precise molecular mechanisms by which this takes place, have remained elusive . In this new publication, Dr. Tonya N. Zeczycki et al. of East Carolina University use OpenSPR’s localized surface plasmon resonance technology to provide them with the key binding data needed for their discovery. Published in the Journal of Biological Chemistry and titled, “Docosahexaenoic acid lowers cardiac mitochondrial enzyme activity by replacing linoleic acid in the phospholipidome” uses binding data generated with OpenSPR to demonstrate that elevated levels of DHA may contribute to various metabolic disease via a reduction in cardiac mitochondrial enzyme activity. Phospholipid acyl chains have been implicated in regulation of an array of trans-membrane enzymes and membrane-associated enzymes via direct binding events . When associated, linoleic acid (LA) and cardiolipin (CL) are culpable in carrying out such regulatory activities with certain enzymatic components of the Electron Transport Chain (ETC); primary interactors of the ETC are protein complexes I, III-V and mobile cytochrome c . Lucidly, these protein-lipid interactors of the ETC grant metabolic homeostasis of resolute importance. However, acyl chain remodeling events in the mitochondrial phospholipidome can cause hapless dysfunction and may result in various metabolic diseases. CL accounts for roughly 15-20% of mitochondrial mass and is considered a major participant with respect to aberrant acyl chain remodeling events . Moreover, docosahexaenoic acid (DHA), an omega-3 fatty acid, has been extensively studied and popularized as an ameliorating factor for macular degeneration, neuroinflammation, neurodegeneration and more relevantly, cardiovascular disease risk factors ; in contrast, the researchers here posture that in elevated levels, DHA may contribute to a reduction in cardiac mitochondrial activity and thereby conferring metabolic dysfunction. In this publication, the researchers produced biomimetic mitochondrial large unilamellar vesicles (LUVs) resembling the composition of the inner mitochondrial membrane. Specifically, LUVs constructed of (18:2)4CL and (22:6)4CL were selected to interact with ETC trans-membrane protein, complex IV, as (22:6)4CL was found to be in elevated levels in response to exposure of dietary DHA in murine models. It should also be noted that prior to biophysical studies, researchers observed lower activity in complex IV post-exposure to DHA. Results from the study demonstrated that binding of LUVs constructed of remodeled (22:6)4CL to complex IV was decidedly divergent from binding of LUVs constructed of non-remodelled (18:2)4CL. These results obtained from surface plasmon resonance studies suggest that the CL-specific binding sites of complex IV were unable to harbor remodeled (22:6)4CL; it should be noted that these binding sites are known to be high-affinity . Surface plasmon resonance (SPR) was used to determine the interactions between LUVs with differing compositions of CL and complex IV. Solubilized complex IV was immobilized on a carboxyl sensor and the protein-lipid experiment was run on an OpenSPR instrument. By using OpenSPR, the researchers were able to determine the kinetic data (association and dissociation rate constants, equilibrium constant and affinity) of the interaction between the (18:2)4CL and (22:6)4CL LUVs and immobilized complex IV. SPR binding curves showed (18:2)4CL LUVs were efficacious in interacting with complex IV and the quantitative data from this experiment show an equilibrium dissociation constant (KD) of 1.8 μM; notably, binding between (22:6)4CL and complex IV was non-detectable and consequentially indicates that complex IV binding sites are incapable of binding remodeled CL. It is also important to note that enzymatic function of complex IV was restored upon introduction of linoleic acid . With that said, the results of this study suggest that elevated levels of DHA in cardiac tissue may contribute to a loss of enzymatic function within the ETC and thereby, endowing potential for development of a number of metabolic diseases. 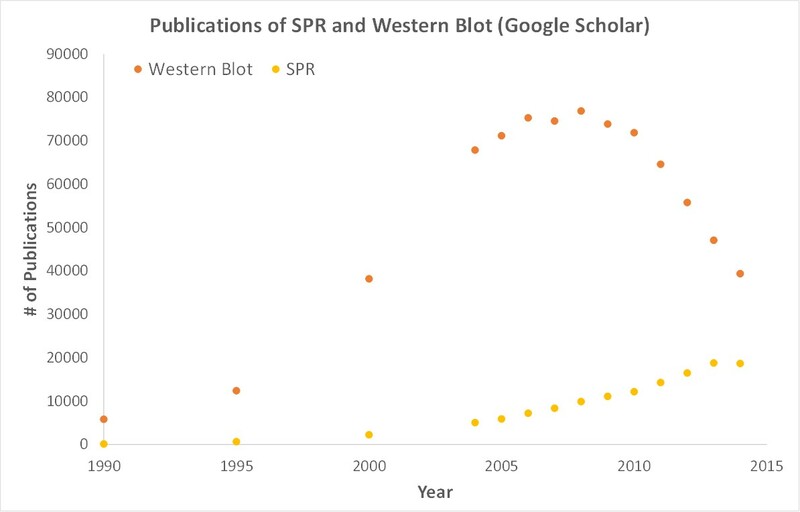 By using OpenSPR, the researchers were able to get SPR data from their own bench, to them accelerate their research and publish their discovery faster.